New Designers is annual event where 3,000 of the most promising graduate talents from Britain’s leading design courses exhibit. Bryn’s work was showcased alongside the best students from the LSBU BSc (Hons) Product Design course. Bryn was awarded with the ‘New Designers Innovate - Helping Inventors Design’ award, receiving a £750 cash prize and a work placement with Innovate Product Design. Bryn will shortly begin his placement with Innovative Product Design and his next goal is to get the SeatLocky patent protected. The LSBU projects on show demonstrated the creativity and ingenuity of the final year students. As well as Bryn’s SeatLocky, LSBU student designs included modular bicycles, sound cancelling panels for indoor gardens and sensor-based musical instruments. “This experience has been fantastic for all of our talented final-year students and we’re very proud that they’ve been recognised for their hard work. New Designers is the UK's leading graduate design exhibition and a unique opportunity for our students to meet internationally renowned design professionals and see what it takes to be part of the workforce,” said Dr Andrews. The LSBU exhibit picked up a number of awards including Absolut Vodka 'top things to see’, Materials KTN pick of New Designers as well as two students interviewed for the Winnovate award. 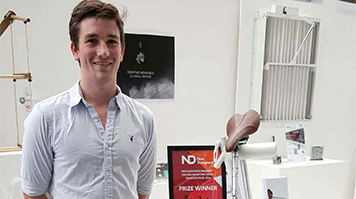 Find out about all the winners at New Designers 2016 and discover more about the Engineering Product Design BSc (Hons) course at LSBU.